August 30, 2014 5:57 pm / 1 Comment on This world is not our home! How can a place we do not necessarily like be the only place we would rather be? Recently someone asked us if we liked living in The Bahamas. Our honest response was, “No, not particularly.” When asked by the same person, where would you rather be right now, we responded, “There is no place we would rather be than right here in The Bahamas.” Now this may sound odd or like we are complaining, being discontent, arrogant, or contradicting ourselves, but we are not. God’s Word teaches us that this world is not our home. The reason for not “feeling at home” somewhere has less to do with physical, earthly location than the fact that as Christians, until we are Home in Glory in the presence of our Creator, we will never feel at home. Recently, during a time of extreme fatigue and stress, I (Mindy) so wanted to just go “home” and rest. Even though I was in our house, I just did not feel at home and could not find comfort and rest. As I contemplated this dilemma, I realized I could not identify anywhere on this planet as my “home”. Instead of allowing myself to despair, I was encouraged, because at that very moment I realized as the song goes, “this world is not my home, I’m just passing through.” My rest does not come from being in a certain location but from resting in my Savior. Prayer requests can be accessed by clicking the prayer request tab above. Everyone who has been to the Bahamas knows how hot and sticky it can get here. While the girl staff were away, Tim installed A/C in their cottage. Because the cost to run an a/c is so high, we only run them on nights when it is absolutely necessary. Zachary and Tim hoisted the outside portion of the split unit up into its place. 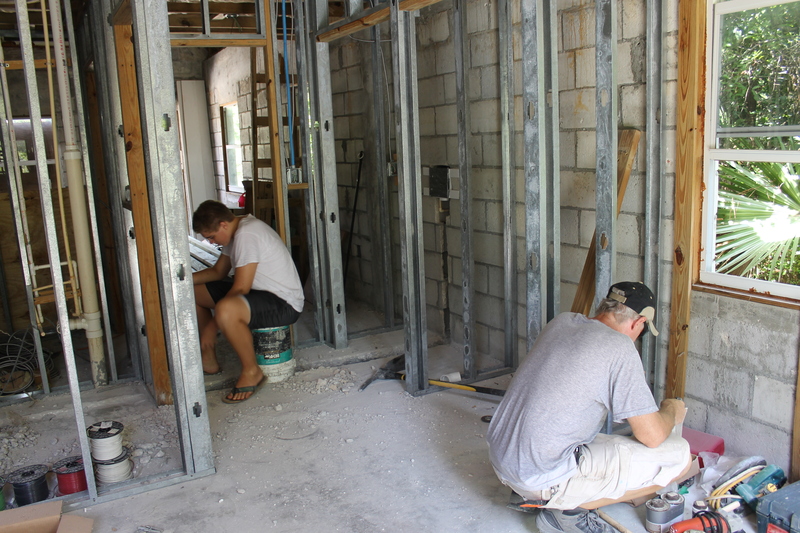 After installing the A/C in the finished staff cottage, it was back to the unfinished cottage to finish the pre construction prep work so the electrician and construction crew could get to work. 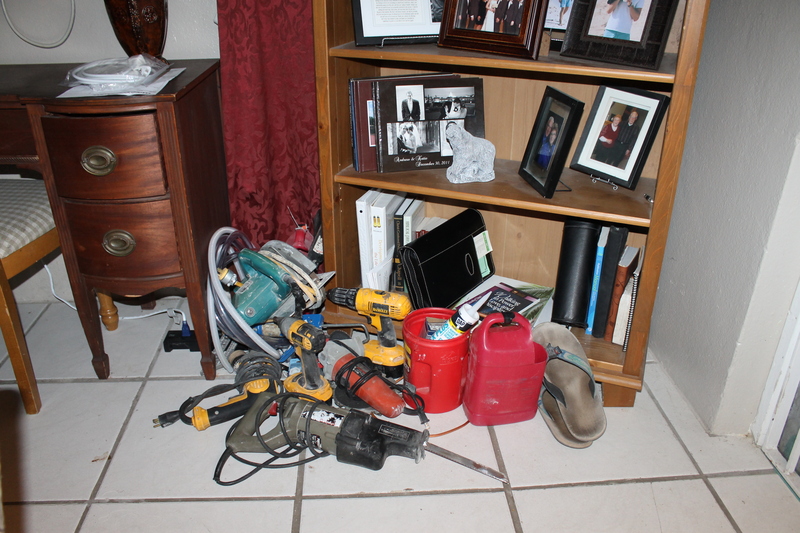 Our house is often the transition spot for tools that we borrow from the ALCentre to use at Camp. We hope to have our own tools here at Camp some day. A LOT of time is wasted going to the Centre to get tools we need. Welcome, Megan Cummings, to Nassau and to the ALC&C! Megan is from Eyota, MN (near Rochester, MN). We have known this young lady since she was about 9 years old. She attended Living Waters Bible Camp, and as the camp nurse, I took care of her often. She heard me speak last year at high school camp at LWBC, and took us up on the invitation to come to the ALC to work as a facilitator. 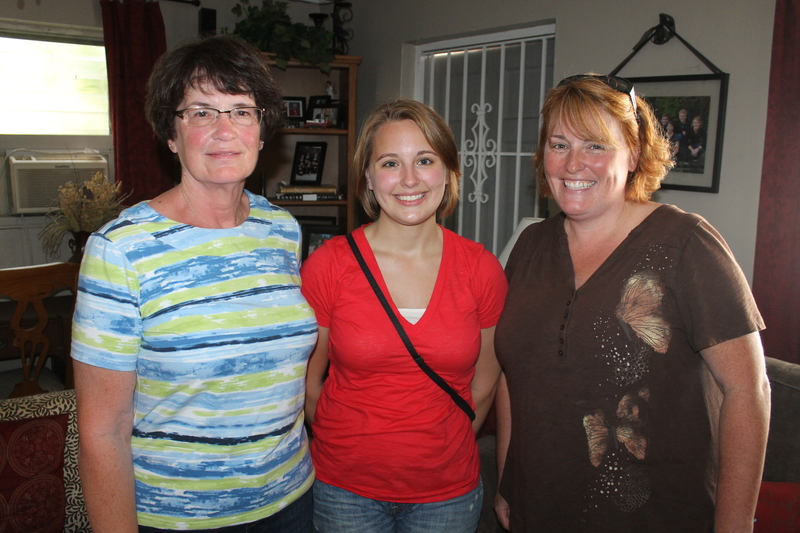 On Sunday, August 9, we picked up Megan, her Mom, and her Grandma at the airport. They vacationed at the Melia for a week before leaving Megan with us here at the ALC&C on the 16th. They wanted to visit the ALC and help Megan transition to her new home. One of the perks of the job we do is getting to be a tour guide. I got to take Megan, her family and the group from Harborview Fellowship Church (Remember that group from the last post? They were still at the Camp when Megan arrived on the island) on a tour of Atlantis. Before Harborview Fellowship mission team left, they gathered around each of us and prayed over us. Harborview team (minus the Mitchell family) left on Wednesday the 13th. 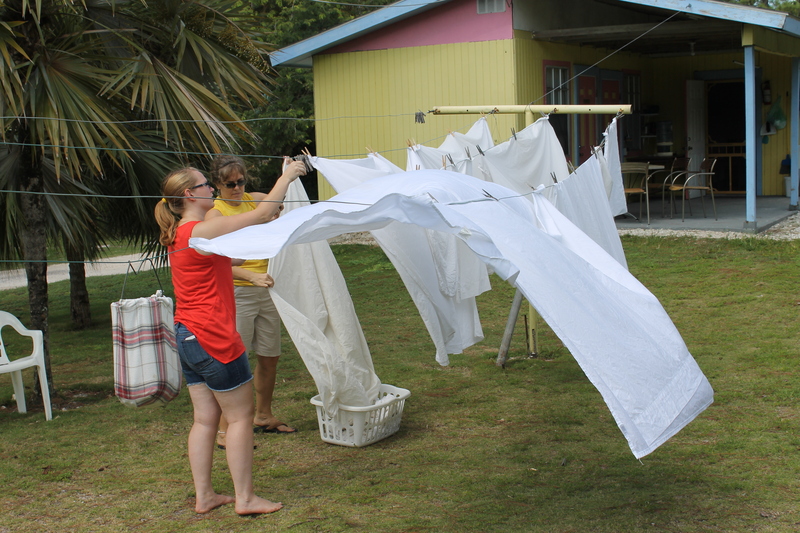 With Nicole’s help, we got >10 loads of sheets and towels done. Nicole was a HUGE help with this. 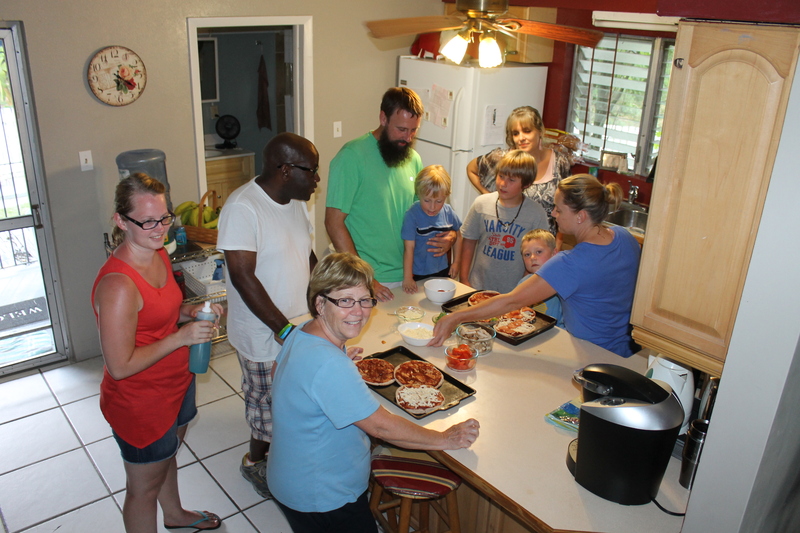 After the Harborview Fellowship team left, their leader Scott Mitchell and his family joined us for make-your-own-pizza night at our house. Julian, Nicole and the Mitchell family joined us at our table for dinner. Scott is the youth and worship pastor at Harborview Fellowship in Gig Harbor, WA. He was the leader of the team and had brought his wife Kindra, 3 sons and mother-in-law. 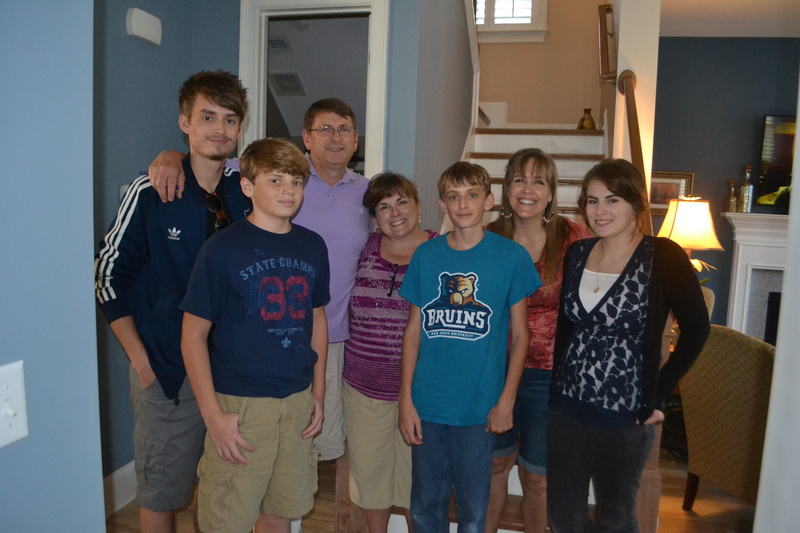 I was able to spend some time with both my sisters’ families in Charleston, SC. this is my older sister Tammy and her family. 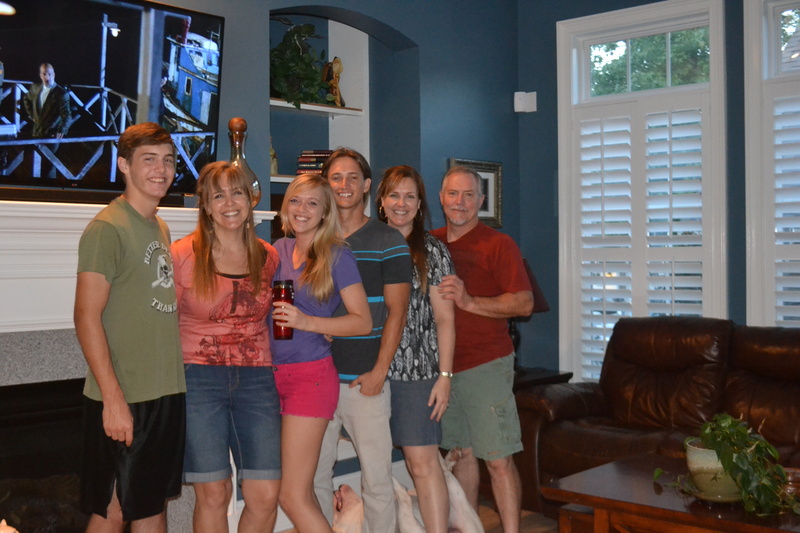 This is my twin sister Missy and her family. While I was gone, work continued. Tim hosted guests from Shekinah Family Word Centre of Nassau. Shakineh’s youth camp leader, Samantha. Samantha used to attend this camp when it was Joy Bible Camp. 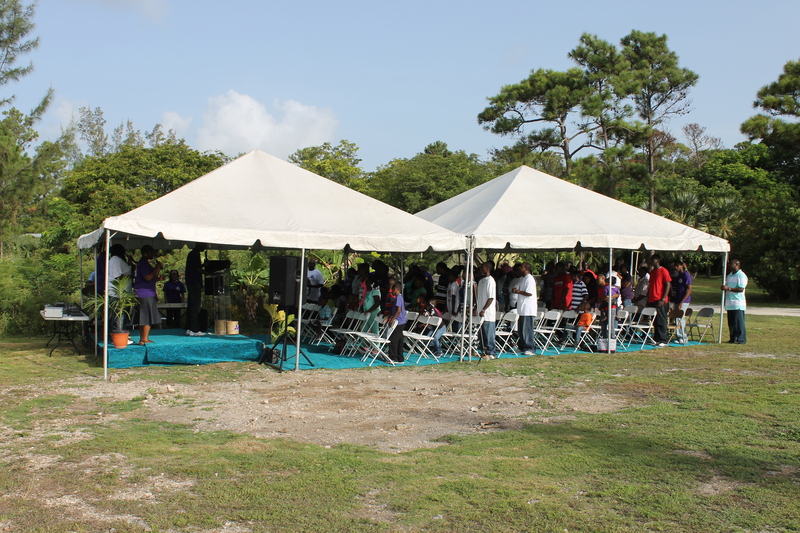 On Sunday, the rest of the church joined the youth at ALCamp for their Sunday morning worship service. 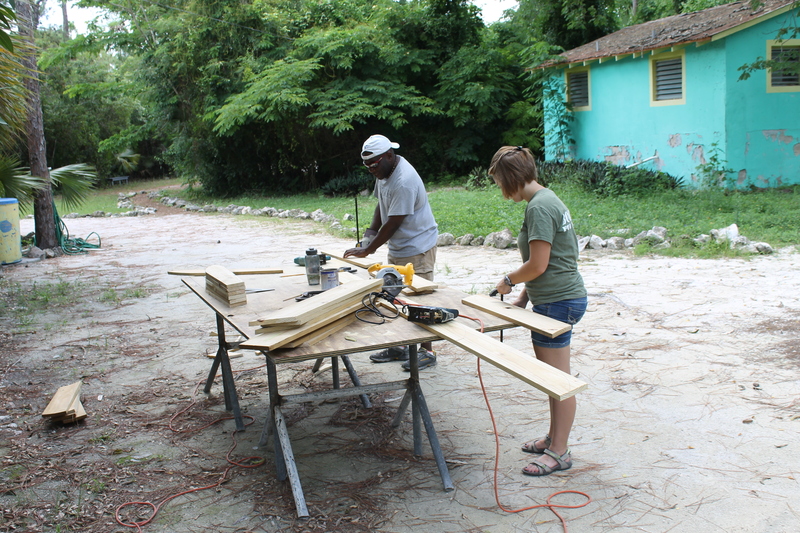 While I was gone, Jullian, Nicole, Megan, Bob and Judi, and Tim worked on projects around the Camp and Centre. 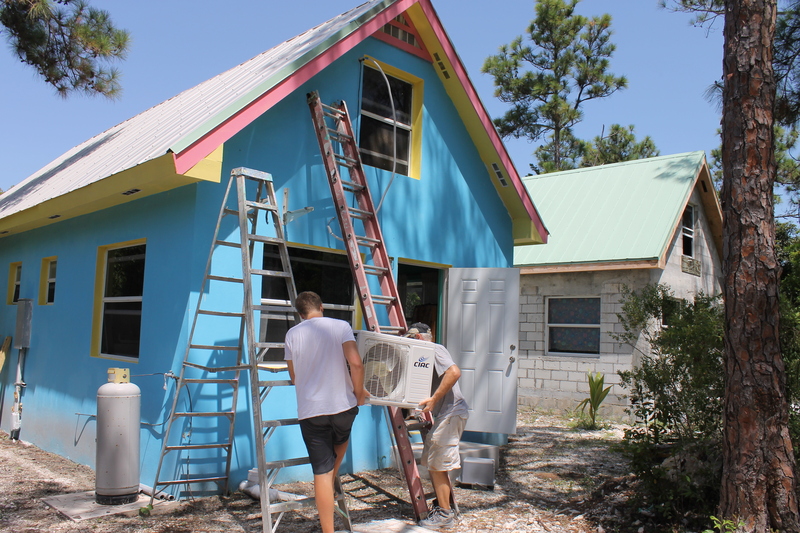 They painted siding boards for the Camp Office building. The during picture of the back porch of our house. 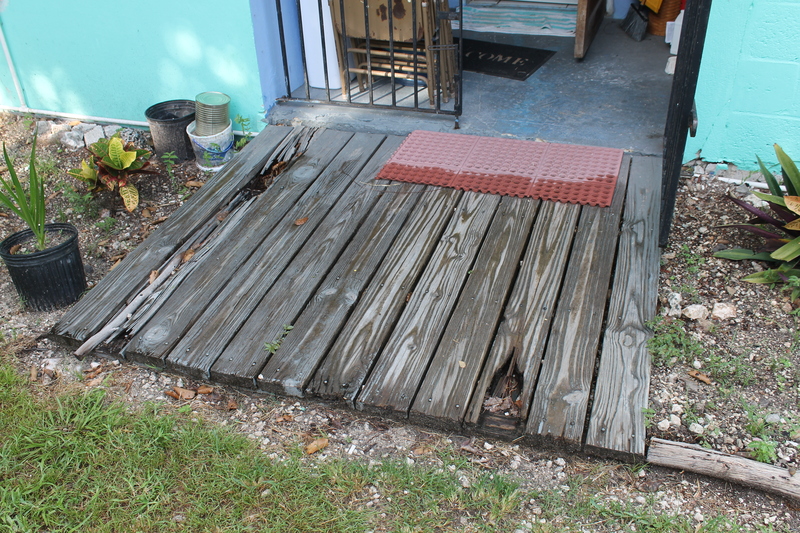 And the after picture of the back porch of our house. Thank you everyone for this great addition! 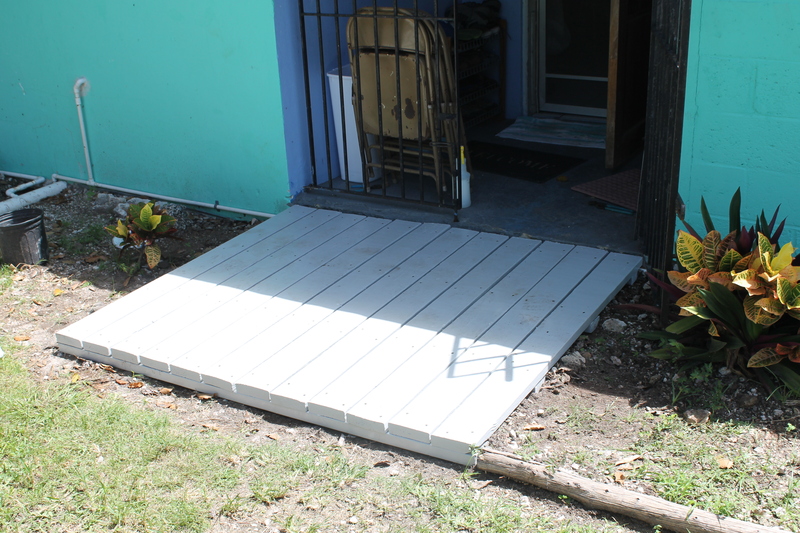 They also replaced the porch boards to Cabin 3 as well. Bob and Faye, Look what will be greeting you in January when you come home! Representative of the past, present and future staff of the ALC: Julian (past), Elton (present), and Megan (future) raised the flag as the Centre hosted a group of children brought to us by Scotia Bank. Jullian and Megan cut and sanded board pieces to make Adirondack chairs for Camp. When I returned to the island, Jullian has not left yet. Of course we got to enjoy his (and Megan’s) presence at our table. The island is full of critters. 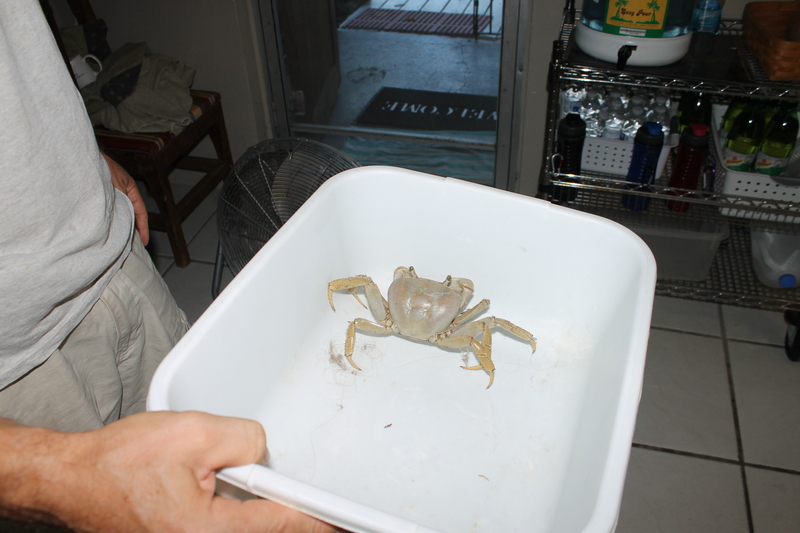 This is a land crab, and he was trying to get in our back door. At first when my eye caught his movement, I thought it was a tarantula. I caught him and Tim released him into the bush (the wooded area for you Americans). 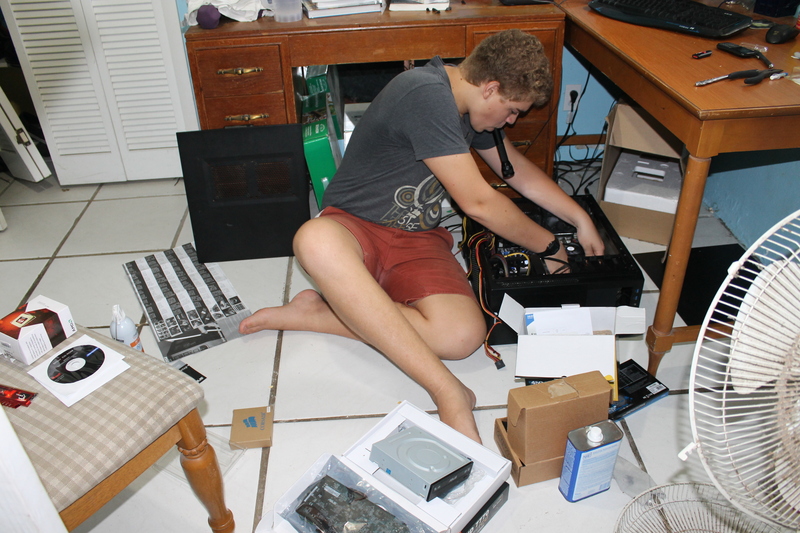 Zachary researched, designed, purchased parts, and built his own desk top computer last December. This past week, it quit working. We think it is the motherboard and have ordered a new one scheduled to arrive tomorrow. Please pray it works! He needs it for school. All good things must come to an end. Jullian left to go back home to Toronto on Wednesday the 27th. This is Pastor Q and his wife Rosemary. They Pastor Q co-pastors Epic Church here in Nassau. This couple is a delight to be with, and we took advantage of the opportunity to host them for lunch and get to know them better. Their church will be having 2 retreats here at the Camp this fall. I returned to the island on Sunday, Jen returned to the island on Tuesday, Jullian left the island on Wednesday, and Thursday one of our new facilitators, Sam Howard from Delhi NY came to the island. (Another facilitator flies in on Sunday the 31st. ) Notice- a table of mostly all females! Finally!!!! In our last couple of blogs, we mentioned we have been in prayer about taking a ministry promotion trip this fall. Trips like these are tiring and costly, but they are necessary. Our goal for the trip is to connect with current supporters, share our needs and offer opportunities for others to partner with us in our ministry work, promote the Adventure Learning Camp for future mission trips, and recruit and share needs for missionary staff at the Adventure Learning Centre and Camp. We have figured the trip is going to cost us about $4500. This includes airfare (Tim, Mindy and Zachary), car rental, gasoline, and cost to attend a pastor’s conference. (This conference is at the front end of the trip and will be a way for us to rest and be rejuvenated after a very busy year). Although this trip involves promoting the ALC&C as well as our personal ministry work, we intend to pay for it out of our own pockets. The monthly support we receive is not sufficient to cover the cost of “extras” such as trips, education expenses (of which there have been some high ones this year), or unexpected expenses. Avoiding these “extras” and dipping into our savings/retirement accounts are how we have been able to pay for these expenses in the past. Unfortunately, all the dipping into our savings is starting to affect us. Would you prayerfully consider how God might use you in helping us with funding this trip? No amount is too small or insignificant. Please write “ministry trip” somewhere in the comment box so we know what the donation is for. We have posted a fundraising thermometer in the sidebar. (This thermometer is different than our monthly support thermometer that has been on the home page since we developed this blog. ) We hope this will not only inform everyone of the progress of our fund raising but also encourage everyone as they see how God is providing! God has promised to provide all our needs (Phillipians 4:19). He also equips those he calls to serve him (I Thesselonians 5:24). Because we believe God has already set in motion the plans for this upcoming trip, we are confident He has already established the provision for the trip. In a sense, the need has already been met; we just don’t know how or when God is going to let us know. Perhaps He will use you! If you are unable to support us monetarily, would you please still support us with your prayers? The look is not the only thing that has changed. Our “Home” page is now static (that means it does not change when new posts are posted) and features our former “About Us” page. Blog posts can be easily accessed by clicking the tab above or the link in the right side bar on the “Home” page. The left side bar has our fund raising thermometer, a link for the organization that collects funds on our behalf, and various ways to follow us and stay connected. Blog posts: Besides the right side bar on the “Home” page, you may click on this tab, and it will take you to our blog posts. Note-the writing of the blog post is very small when accessed by the tab. To make it larger and more readable, click on the title of the post, and the post will become bigger. Contact Us: This is self explanatory. Follow Us: If you are not following us on Facebook or on WordPress, you are invited to access the “Follow us” tab to learn how to start following us. Following us on Facebook and WordPress provides you updates and information on what we are doing on a more regular basis. Email Sign-up: Access this tab if you want to sign up to receive our email updates directly from us. This “Email Update Sign-up” is different then following our blog or following us on Facebook because our email update list is the list we use when we want to notify everyone that a new blog has posted or if we have urgent information or prayer requests we need to share with our friends/relatives/supporters. We also use the email to let everyone know of upcoming trip itineraries (the blog site is open to anyone who accesses it, and some information is not safe to disseminate to the general public). Prayer: This list will have ongoing prayer requests as well as new and time sensitive requests. Many ask us how they can better pray for us. We hope this will help keep you up to date on how to pray for us. Support our Ministry/Donate: We are not employed by the Adventure Learning Centre and Camp and do not receive monetary compensation for the work we do while serving at the Adventure Learning Camp. Our sole form of financial support is the generous contributions of others who, like us, love Jesus and desire to see needs met and the Gospel proclaimed to all men, women and children in this world. Periodically people ask us how they can make a tax deductible donation to our ministry work. There are now 2 ways to access Shepherd Staff Mission Facilitator’s website from our website. The first is by clicking the link in the left side bar on our “Home” page or right side bar on the “blog post” page. The other is by clicking the “Support our ministry/Donate” tab above and then clicking on the link. Upcoming Events: This tab will keep everyone updated on events that are coming up in our personal lives, in our ministry work or in the ALC&C ministry. This is where we will post not-so-detailed trip information (so you know if we will be coming to your area), important events in our lives and in the ministry here, needs and wish lists, etc. I hope this has been helpful in orientating you to our new website! Enjoy. It has only been a week since our last blog, so there are not many new pictures. Nonetheless, we hope you will find the ones we do post helpful as you try to stay updated on what is going on with us. Look who is not the tallest ALC person anymore! Zachary (6’3) has passed Mark Wallace (6’2) by an inch. We had to say good-bye to Huram Joseph on Saturday. He left to go back to Florida on Sunday. We enjoyed having him here this summer. 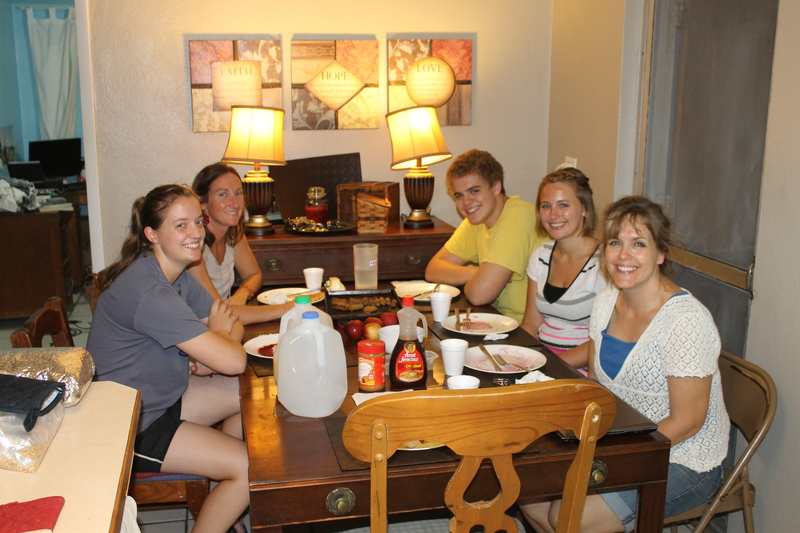 He spent Saturday evening with us eating homemade personal pan pizzas and watching “Son of God”. This past weekend Ms. Ada had Boys Brigade here at Camp. It was fun hearing the laughter of children around Camp. Saturday Jen Rogers (right) left the island for a 3 week vacation. Rachel (left) who had been here for a month helping at the Day Camp also left to go back to Florida on Saturday. Over the weekend our electrician Fabian and his helper were at Camp to start putting electrical wiring into the staff cottage. Our general contractor Scott will be in the cottage working soon as well. Construction is finally underway! 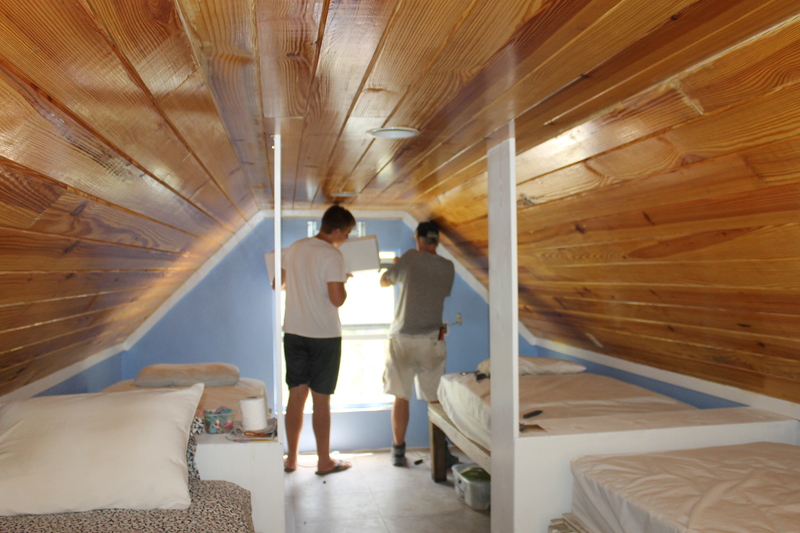 Saturday, Tim began the all day project of installing air conditioning in Cabin 1. It also took some work on Sunday as well since he ran into some issues on Saturday. Too bad he couldn’t enjoy cool a/c while he worked, he went through at least 3 t-shirts. 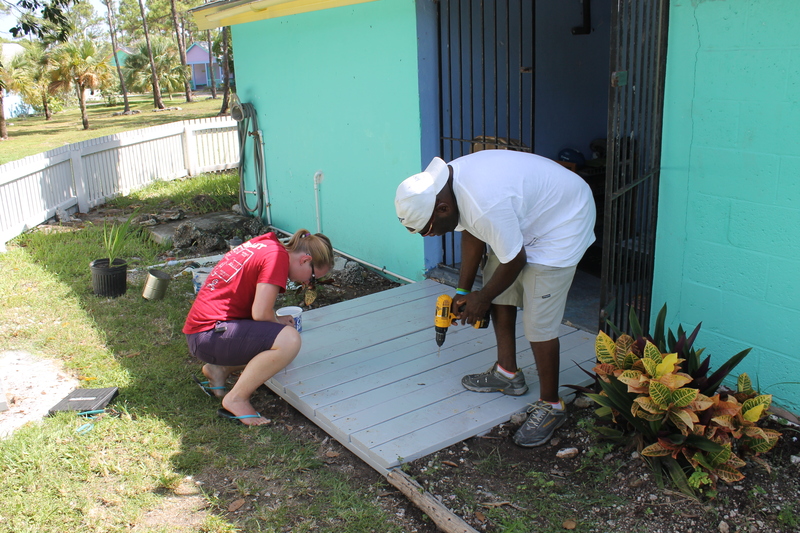 On Monday, though it was a Bahamian holiday, we continued working. Not only were we still serving Boys Brigade. Tim continued working on installing air conditioners. This time, the a/c was going in to Cabin 4. Outside view of the air conditioner in Cabin 4. By God’s grace, Tim was able to get the a/c’s installed and functioning in both Cabins before the Tuesday arrival of our group from Washington. 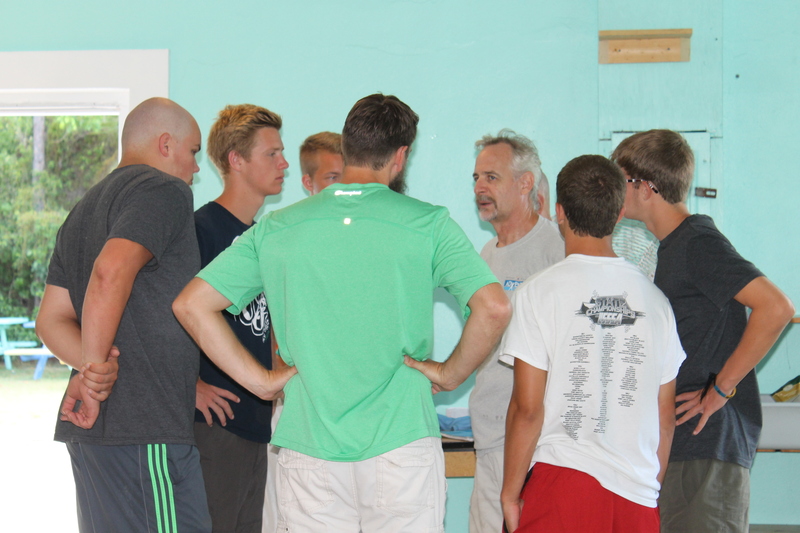 Tuesday we welcomed a mission team all the way from Gig Harbor, Washington. When this picture was taken, these poor people had arrived on the island after traveling all night and all day. They left at 1045pm from Washington (that is 145am our time) and arrived in Nassau at 207pm. On Wednesday morning, they looked a whole lot fresher! RJ and his sister Savannah are the Adventure Learning Centre’s office manager’s children. RJ is good friends with Zachary and spends most of his days with us. Zachary helping his Dad work on the staff cottage. He is helping to bust up the concrete to lay pipes. What 15 year old boy does not working with power tools? Zachary jack hammering the floor while RJ and Savannah watch. 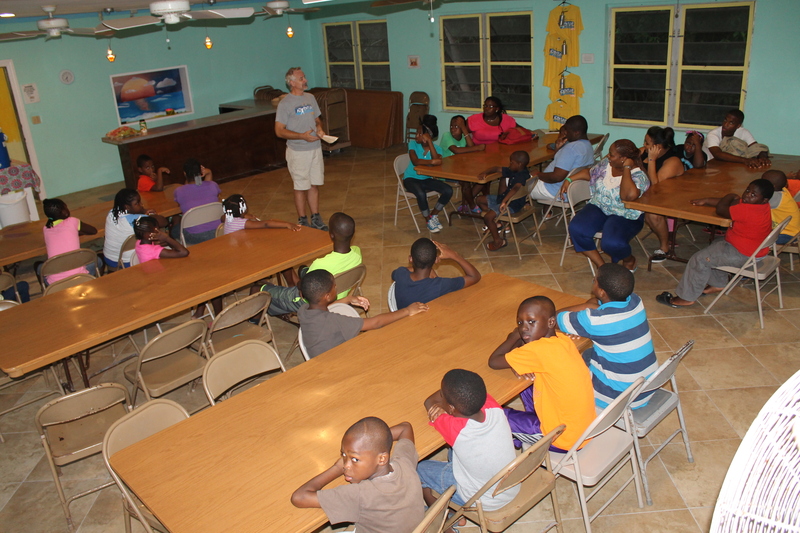 39 children came to Camp for a VBS hosted by the Harboview Mission Team. They started their day with a coloring activity. It was neat getting to see the young people in the group working with the children. Of course no VBS would be complete with out action songs! What better place to have a VBS then at Adventure Learning Camp. It is safer and has more green space than most churches do. We are hoping more mission teams take advantage of our space and host more VBS outreaches for children here at Adventure Learning Camp! August 2, 2014 12:31 am / 1 Comment on Who do we work for? 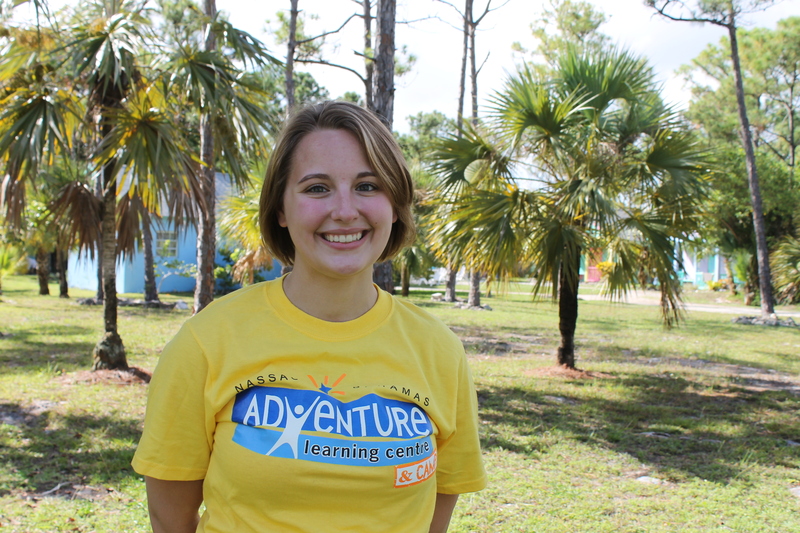 Our days are spent serving at the Camp side of Adventure Learning Centre and Camp in Nassau, Bahamas, but did you know that we are not actually employed by Adventure Learning Centre and Camp? We all are on this earth to live lives that bring glory to God. We serve Him in everything we do, and that includes in what occupies our time. For us, our occupation is full time ministry to others in a country that is not our passport country. 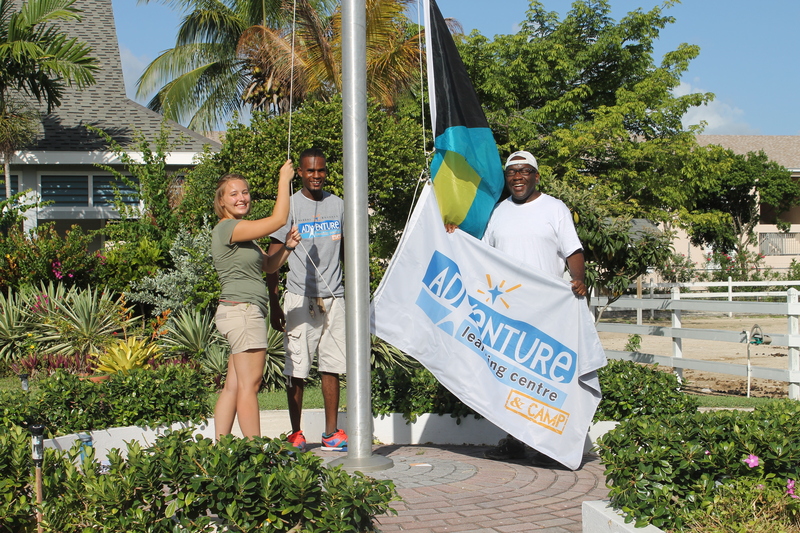 Our days are spent serving at the Adventure Learning Centre and Camp in Nassau, Bahamas, but did you know that we are not actually employed by Adventure Learning Centre and Camp? Lately, this has come up in conversations, and many do not know that we are not employed nor do we receive monetary compensation from the ALC&C for the work we do here. Like many missionaries, we raise our support in the United States and rely on faith that God will provide us with the money we need through the generous giving of others who have committed to support us in the work we do. We ultimately work for God, but in a sense one can say we work for those who faithfully support us. We are the hands and feet of the many would-be missionaries who are unable to be out doing the work we are called to do. We are very aware, humbled and appreciative of all support entrusted to us through the generosity of others, and we diligently try to be good stewards of the resources God has given us. At no time do we pause and take notice of how we are spending our time and money more than when it comes time to travel. When it comes time to spend time and money to travel, not only are we concerned about whether we can afford the expense, we are very reluctant to share news of our travels. Past trips we have announced provoked some rather insensitive remarks from people who don’t understand what we do. Some people do not seem to understand that a trip back to the United States is not necessarily a vacation. 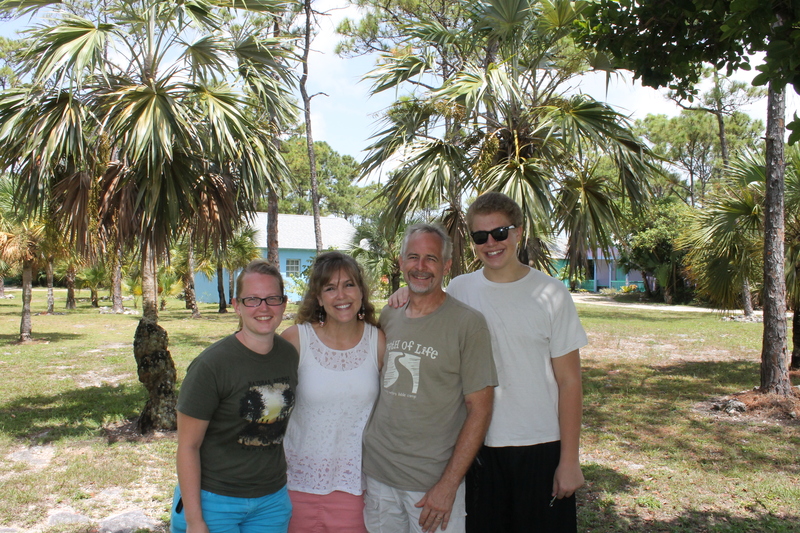 Like trips made by other missionaries, our trips back are rarely restful and relaxing. It is a necessary part of what we do. Generally most of our time is spent visiting with family/friends/supporters, planning and preparing reports and updates, speaking at churches, and staying connected with the job on the field via phone and internet. With this said, after much prayer, we have decided that we will be taking a ministry-related trip this fall. It will be during a time that is considered relative “down time” here at Adventure Learning Camp. Traditionally during the months of later October to early December, only a few guest groups come and use Camp; therefore, we have decided mid October-December 1st is the best time to leave the island. The trip will serve several purposes. First, we hope to find some time to rest and be rejuvenated in body and soul. Our plan is to attend a pastor’s conference at the front end of the trip. The goal is to be fed spiritually and rest while spending time with our current Pastor and his wife Alexine Moss and our friends (and former pastor) Keith and Kristin Bunting. We are hoping it is just what we need to get us ready for the 6 weeks of travel we have planned. 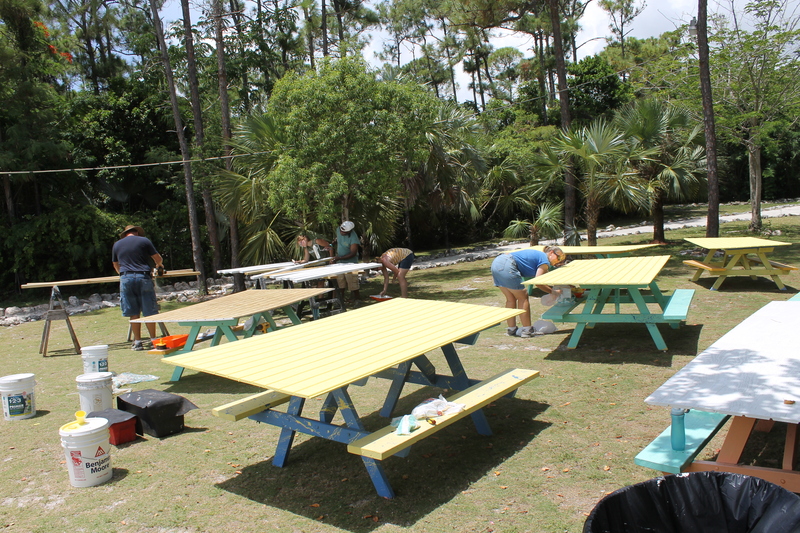 Second, we plan to connect with churches and groups that have recently been to the Bahamas and stayed at the Camp as well as with others that have either never been here or have not been here in many years. We are also hoping to let people know about the ministry, promote the Camp for future mission teams, and recruit missionary facilitator staff for the Centre. Finally, we will be visiting current and prospective supporters to increase our support base and maintain relationships with those who already support us. God has always faithfully supplied our needs, and we have no reason to doubt He won’t continue. However, we realize we need to work to maintain our current support base and gain new support as the Lord guides and directs. We will not post a detailed itinerary on this blog for safety reasons, but we will private message the itinerary in the email that we send out to announce this blog post. If you don’t get our emails, you may be added to the list to receive the emails by signing up through the “newsletter sign-up” link above or in the side bar. In our last update, we finished off in early June. 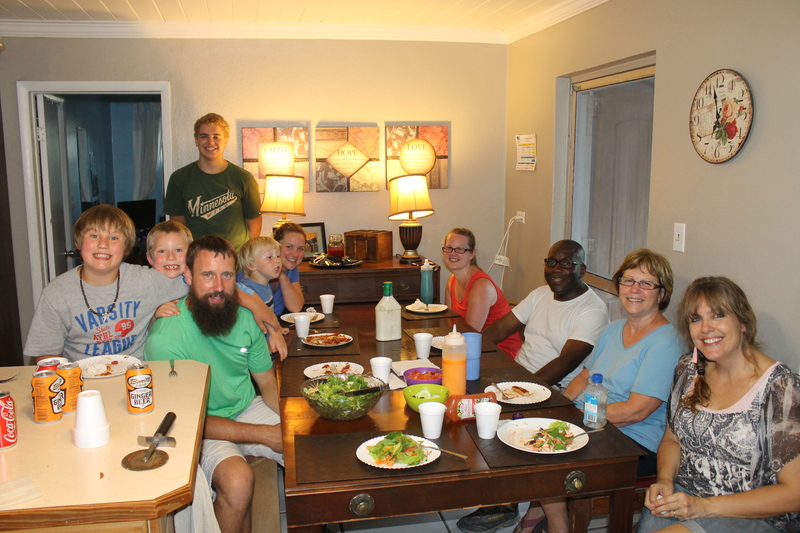 Logan was already gone, Zachary had just left for his 5 week trip to the states, and preparations were being made at the Centre for Summer Day Camp and at the Camp for summer mission teams. Temporary staff, Andia and Twins Paige and Dakota spent a lot of time in May and June putting together props for Summer Day Camp at the Centre. Tika, Sam and Jen did a lot of prep. work for Summer Camp as well. Great job ladies! The summer theme was African Safari. 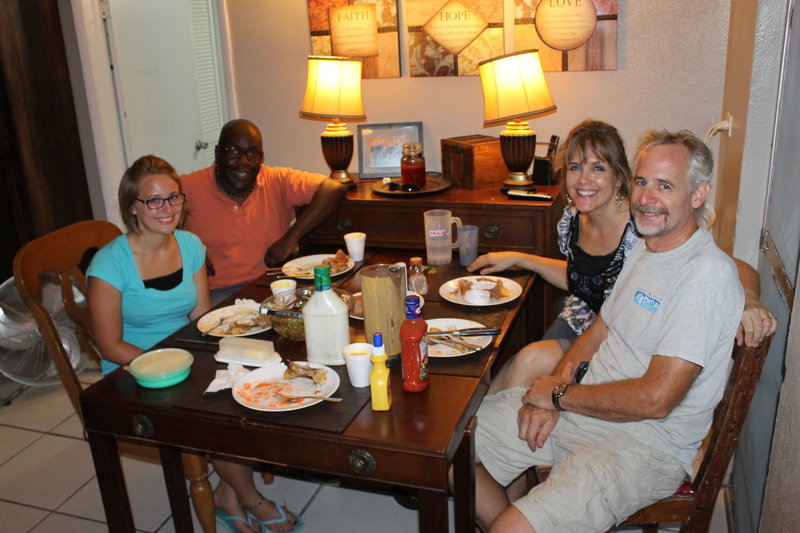 We finally had the opportunity to have Brandon and Huram over for dinner before the crazy summer schedule began. Eric Nelson (the Centre’s program director) and his girlfriend Brittany also joined us. While playing Jenga, the power went out. Power outages and cable/internet outages…just a couple of the inconveniences that try our patience. The internet and cable went out on Tuesday June 10th. It took 8 days for Cable Bahamas to finally make it out to fix a problem that took them all of 10 minutes to repair. We have not had any problems since. In the foreground, our grounds workers Celavia and Odisa were dealing with a problem of their own-lawn mower failures. Cabins all spruced up and ready for the summer mission teams and groups! Kevin helped me go through all the donated medical supplies. We put together first aid kits for the buses, Centre, and Camp. Sunday morning, June 22nd was the Buntings last Sunday at Kingdom Life Church. It was a sad day for us; grief compounded by the fact that we had already had so many painful good-byes that month. The worship team sure misses the Buntings. 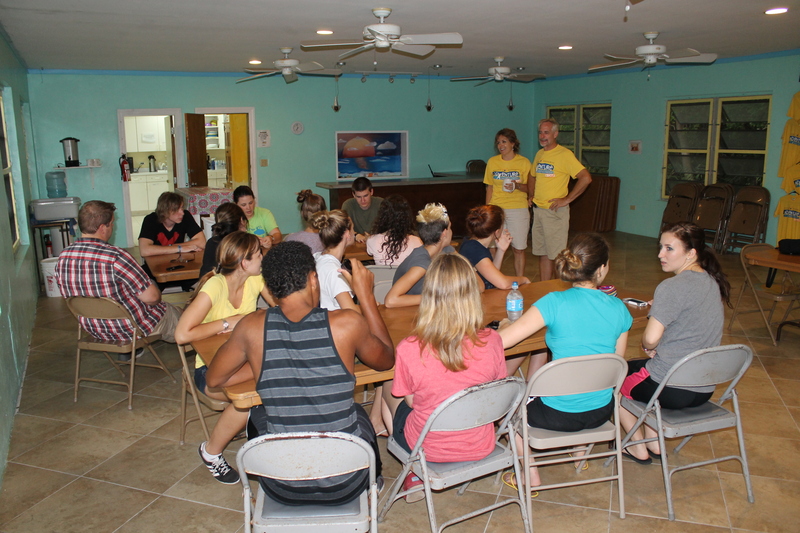 Sunday afternoon, June 22nd, we welcomed our first Mission Discovery team to Camp. Evening times were time for worship, debriefing and a challenge. That first night, Tim gave orientation to the group. Afterwards we escaped Camp and met the Buntings at our favorite spot to meet, B’s Ice Cream Parlour. We went back to their house afterwards to have a private time of saying good-bye to our dear friends. The first Mission Discovery Team was made up of folks from Texas, Baltimore and Alabama. They served with Pastor Bazile’s church, and the girls and boys detention centers. 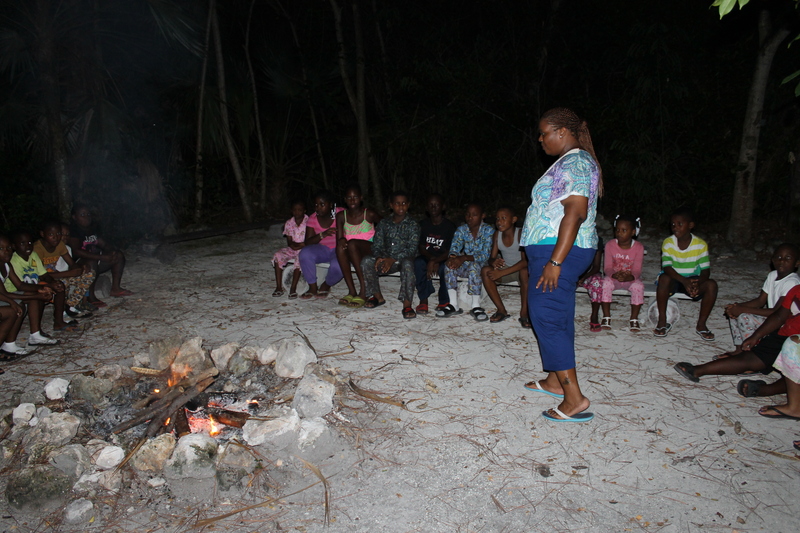 While we were serving mission teams at the Camp, the Centre was running a day camp for 5 yr old – 13 yr olds. Jen Rogers did a great job making Bible stories come alive for the children at the day camp. Here she is teaching about Moses. Huram loved being a camp counselor, and the campers loved him! Brandon was not able to stay the whole summer, but what he did do for the kids at the summer camp was great. The kids loved him. We had some special visitors in June. This is Vic and Ethel Coffman from the Minneapolis, MN area. Tim grew up going to church with them and their 3 boys. Every night, the Mission Discovery leadership team held debriefs. We were included in them and joined them a couple of times. These are the parents of the boy from Calvary Chapel 8th grade trip 2 that fell at Centre in February and broke his arm. 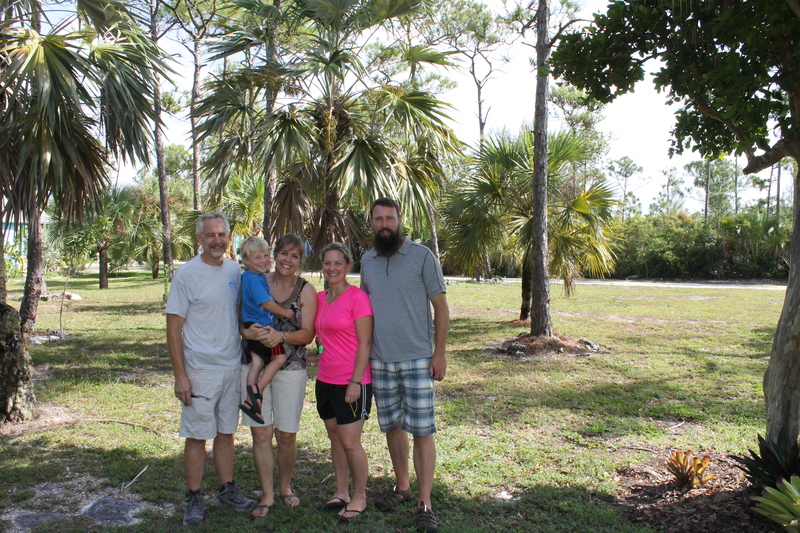 Frank and Laura Morris were on the island while their cruise ship was in port. They wanted to see the ALC&C, so I went and picked them up and gave them a mini tour of the island and the ministry. …and picked up a yummy tropical conch salad to share for a beach lunch picnic. It was great to get away from camp for a few hours! On Sunday, Mission Discovery week 2 began. Mission Discovery week 2 participants were from Connecticut and Kentucky. We had a visit from some people we had never met before but who know Tim’s parents know. They came by to see the Camp. The man on the left lives here on the island. His name is Robert Davis. The couple are the Carters from North Carolina. On July 3rd, we went to bed around 900pm when the power went out. We woke up at 3am when the power came back on. How did we know when it came back on? First of all, it was so hot that night, we did not sleep very well. Also, like everyone else, we awoke to fans coming on, microwaves beeping, and lights that we did not know were still in the on position coming on. On July 4th at about the time the mission team was returning to Camp to take showers, the power went out again. We fired up the generator to operate the pump. This time it was out for 4 hours. These were island wide power outages due to “equipment failures” with BEC (Bahamas Electric Company). July 4th–it is not only our passport country’s birthday, it is also Judi’s birthday. We made her cheesecake! 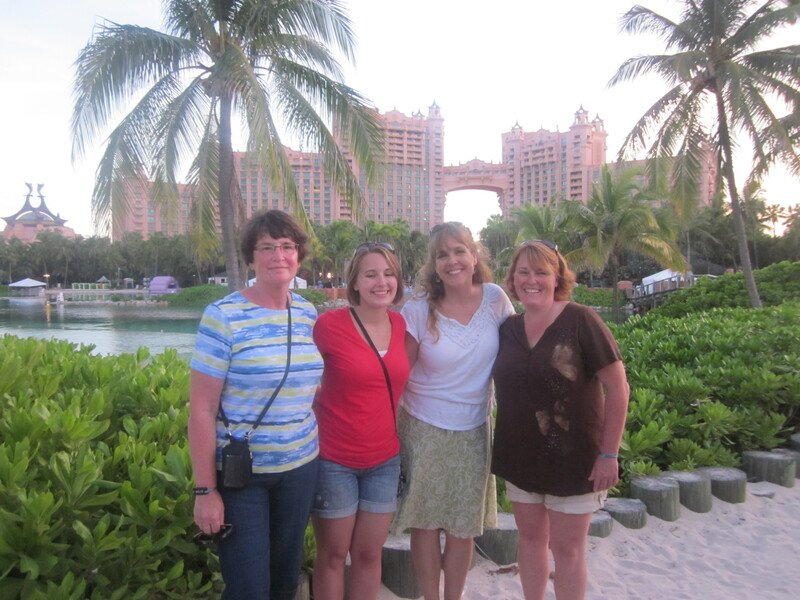 To celebrate July 4th, we went with the Mission Discovery team to Paradise Island. We joined them for their evening worship time. Afterwards we celebrated the United State’s birthday with everyone on the beach while watching fireworks compliments of the Atlantis Hotel. It was awesome! On Saturday, July 5th, we were able to sneak away for another date night. This time we went to the Cricket Club, an English style restaurant—fish and chips and chicken pot pie. These are an interesting fruit we found and got to sample in a store here. It is called Rambutan. You break them open and eat the fruit off a large pit. It is very good. There is a Bahamian fruit similar to these called genips. Week 3 of Mission Discovery started on July 6th, and it was the biggest with 55 people. On July 9th, we said good-bye to Brandon Meyer. He was a great help at the Centre, and we enjoyed getting to know this young man. 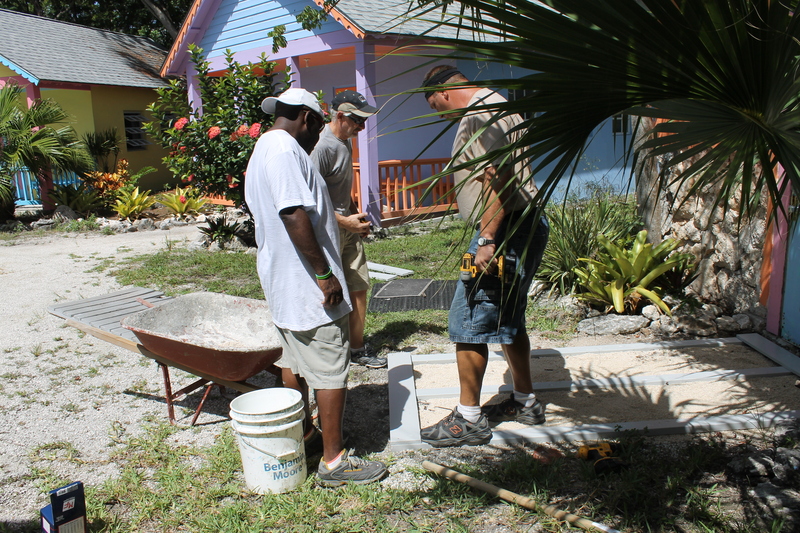 During the day when Mission Discovery was off site, we began getting the unfinished cottage prepped for construction to commence. The cottage has been used for storage for a long time. Everything must go before construction can begin. 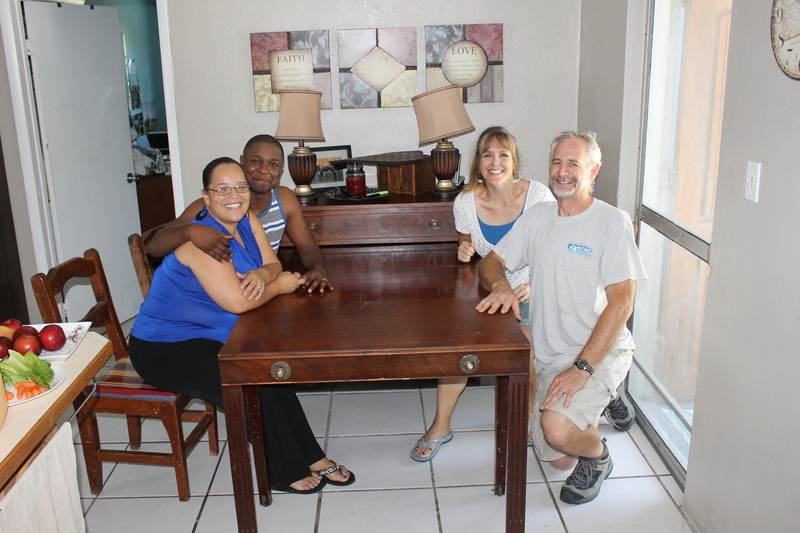 One of the leaders of Mission Discovery, Gary Lane from Atlanta, is a cabinet maker. He blessed the ALC by replacing the very worn counter top in the Centre kitchen. He worked a very long, hard day to get the counter done. Huram and Eric spent their day off helping as well. Way to go guys! One of the more enjoyable jobs I get to do is play hostess and tour guide to people who come to the island and want to see the ministry. I pick them up at the cruise ship port and take them around the island and down here to the ALC&C to see what we do here. Yikes! The walls of our house are infested with termites. I noticed some bubbling of the back splash behind our stove. When I touched the bubbles, it broke open and out poured termites. I don’t even want to think of the work we are going to have to do to get this infestation taken care of. Please PRAY! …the finished product, banana pudding! After Indiana, he flew to Tennessee to stay a couple weeks with his best friend, Granton Ledgister. These two have been best friends for many years. After Tennessee, it was on to Charleston, SC to go on vacation with his Aunt Missy, Uncle Chuck and cousin Liam. His aunt and uncle blessed him with this camping trip with their friends. We are so glad Zachary had this opportunity to take a nice vacation, something we haven’t had time to give him. Thank you Missy and Chuck! The spoiling and blessing continued. For week t’wo of Zachary’s stay in Charleston, SC, he stayed at my older sister’s house. They took him to an amusement park. Thank you, John and Tammy! The last day of Mission Discovery was July 12th. 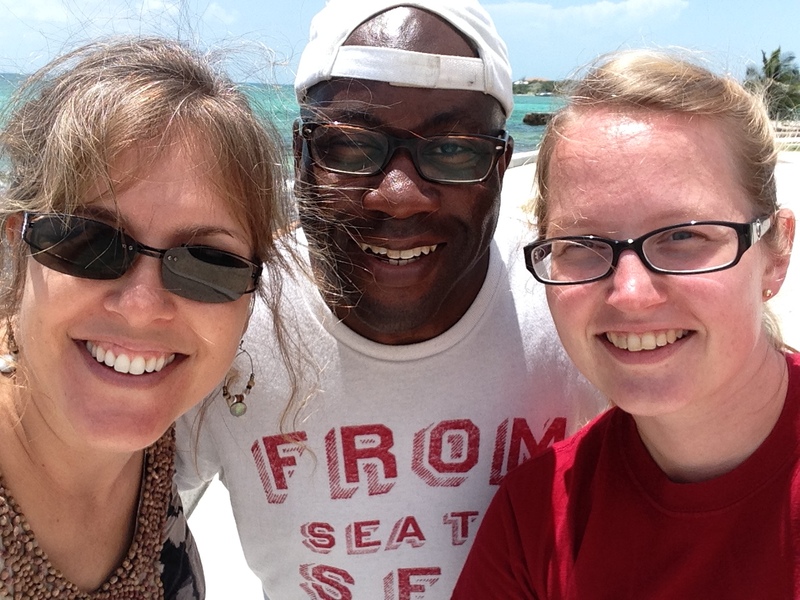 This is Pastor Bazile, one of the Haitian pastors that MD mission teams works with. Myron Rolle Foundation weak planning session…Mission Discovery teams left at 9am on Saturday morning, and by 10am we were planning for, working with, and assisting the Myron Rolle Foundation. We were unaware until shortly before their arrival that they were coming in on Saturday instead of Sunday. Mission Discovery leadership team did not leave until Sunday, so we were thrust in to planning and working with the next group before the MD team was out. It all worked out, but it meant we worked 16 hours on Saturday and 14-16 hours on Sunday. That was probably the most tiring, stressful two days for us to date. Myron Rolle (left) with his father and two of his four brothers. Myron Rolle and Stacy orientating the mentors/leaders for the Wellness and Leadership Camp. After 3 weeks of camp food, it was time to sit down to my own cooking. What says, “Good, home cooking” better than a pot roast and vegetables and tossed salad? We invited the Mission Discovery Leadership Team to join us. On Sunday, July 13th, the Myron Rolle Foundation Wellness and Leadership Academy camp opened with a ceremony at the Centre. Tim was among the speakers. Myron Rolle opening the camp. On Tuesday, July 15th, we welcomed the now 6’3 Zachary! An airport run with hellos instead of good-byes. We stopped for supper at Thai Lotus on the way home from the airport. We were able to host and tour guide a group of ladies who had come into port on a cruise ship. This time, the contact was through a lady from our sending church in Wisconsin. RJ and Zachary helped us clean and move furniture around. We relocated Tim’s office to a larger room to accommodate a second desk for me or a future secretary to use. We had quite a bit of rain on one day. This storm also caused power outages. Finally a day off! We had 1 day between Myron Rolle leaving and our next mission trip coming in, so we took Zachary to a favorite restaurant. A sad gathering…our church care group got together to say good-bye to the Dean family. We are going to miss Calvin, Keisha, Katie and CJ Dean. 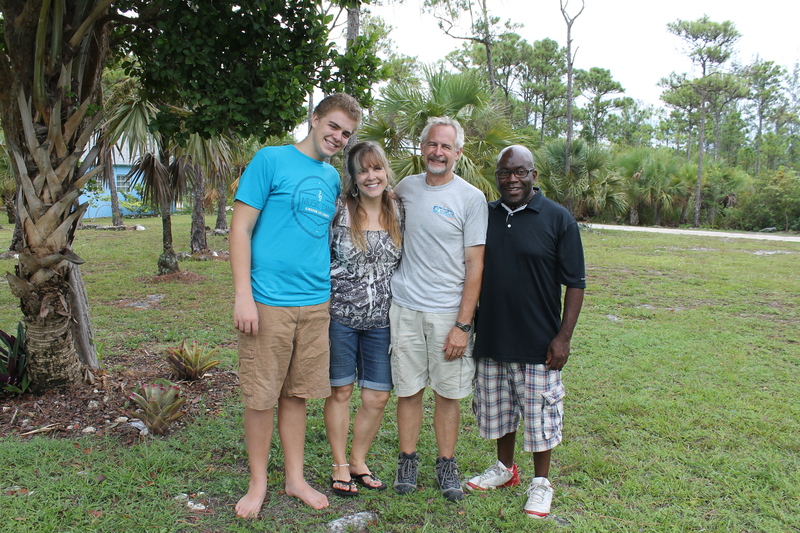 We welcomed a mission team from Metro Life in Orlando, Florida to camp for a 10 day trip. It was a joy serving these guys and gals. They ministered at a Music Camp at Kingdom Life Church. The day the group arrived, Judi’s grandmother died in Wisconsin. The group took the time to gather around the Balsons and pray for them. Because Bob and Judi had to leave to go to her Grandma’s funeral, we cooked for the group—Tim for breakfast, and me for supper. It felt like old times again. The old bath house on the left looks tiny compared to the new bath house. While the team was gone during the day, Tim began working on making room in the old bath house to store things stored in the unfinished cottage. Demo work in the women’s side of the old bath house. A new temporary home for drying green-treated lumber. Even among time spent serving and cooking for the mission team and doing demo and moving work around camp, we had time to sit down with Sydney and Yvonne Bootle to begin planning for a Joy Bible Camp reunion scheduled for September 27th. At the end of the Music Camp at Kingdom Life Church, this team led the campers to perform a very nice program for parents. The program was fun to watch. Zachary hung out with the team all week (that was so nice to see!). They worked together and played together. The group even blessed Zachary and took him with them to Rose Island. Thank you, Metro Life! 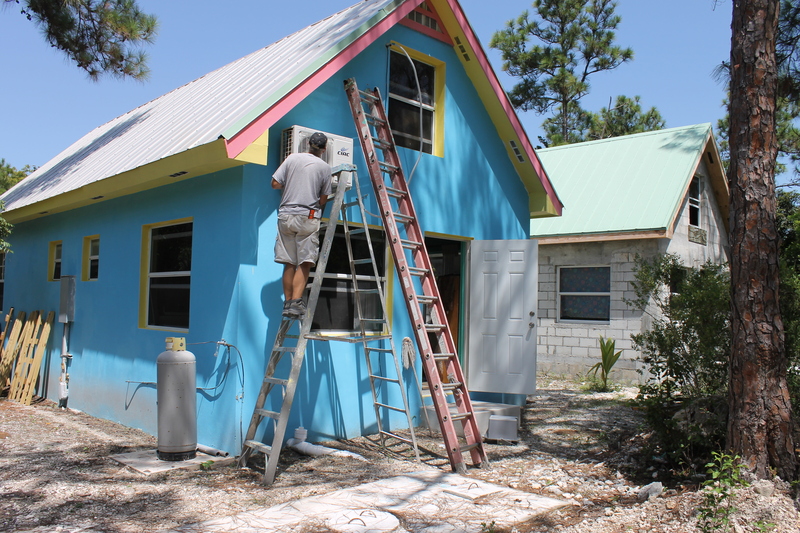 Tim installing an exterior electrical outlet on the girl staff cottage so the new cottage has electricity. Tom was a huge blessing and help. Even before Judi’s grandma died, Tom came to help for a couple of weeks. God knew we were going to need him while Bob was away. It was nice having him and his laugh back. On Monday, July 28th, Metro Life left. This past week Tim, Zachary and RJ worked to get things out of the unfinished cottage. It took a good part of 4 days for RJ and Zachary to get all the bunk beds apart so they can be removed from the cabin. Way to go RJ and Zachary! Exciting!!! Plans are moving along now for a Joy Bible Camp reunion. 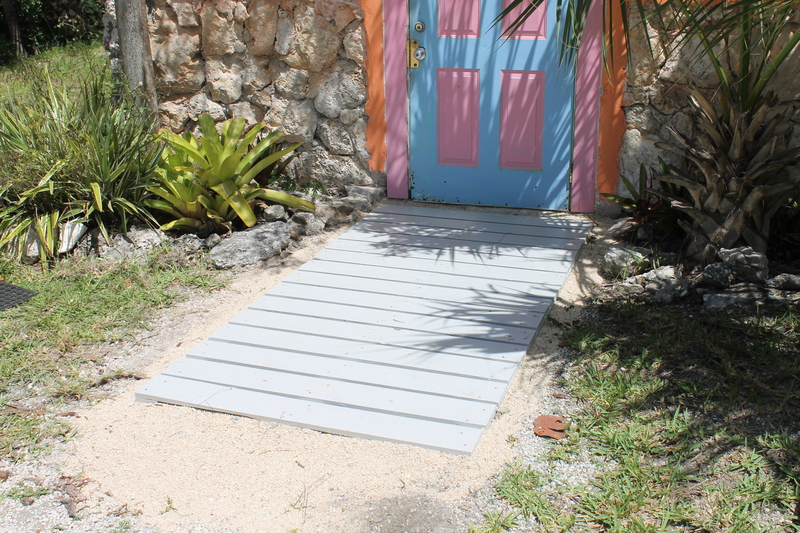 ALCamp used to be Joy Bible Camp and has impacted a lot of Bahamian people. We are working on rekindling that spirit. Tuesday, July 29, we met with 8 former campers/staff. Eight former Joy Bible Camp staff/campers. There stories are fascinating. We are so excited to be working with these people. Stay tuned for future plans to start a local outreach for neighborhood young people and eventually a summer kid’s camp program at ALCamp (formerly Joy Bible Camp). Kingdom LIfe Church got together Wednesday evening to say good-bye to the Deans. My birthday was Thursday. Judi surprised me with these beautiful flowers she picked and arranged. Gorgeous! Birthday selfie with my hubby on the beach across from Orange Hill Resort on the upper west side of the island. Anniversary selfie in front of the Orange Hill resort. Tim took me to this resort for the night between my birthday and our anniversary. Thank you for taking the time to get caught up on what is going on around here!